Its body is elongated and covered with small, scarcely visible scales; the back is an iridescent blue, while the sides are silvery with a pattern of irregular vertical blue bars. These colors fade rapidly at death. The mouth is large, and the teeth of the wahoo are razor sharp. Both the upper and lower jaws have a somewhat sharper appearance than those of king or Spanish mackerel. Specimens have been recorded at up to 2.5 m (8 ft 2 in) in length, and weighing up to 83 kg (183 lb). Growth can be rapid. Wahoo can swim up to 60 mph (96.5606 km/h). They are some of the fastest fish in the sea. The barracuda is sometimes confused with mackerel and wahoo, but is easy to distinguish from the latter two species. Barracuda have prominent scales, larger, dagger-like teeth, and lack the caudal keels and blade-like (forked) tail characteristic of the scombrids. Wahoo tend to be solitary or occur in loose-knit groups of two or three fish. Where conditions are suitable, they can be found in schools as large as 100 or more. Their diet is made up of other fish and squid. Most wahoo taken have a trematode parasite living in their stomachs, the giant stomach worm (Hirudinella ventricosa), which does not appear to harm the fish. Although local wahoo populations can be affected by heavy commercial and sports fishing pressure, wahoo as a species are less susceptible to industrial commercial fishing than more tightly schooling and abundant species such as tuna. Wahoo are regularly taken as a bycatch in various commercial fisheries, including longline fisheries for tuna, billfish, and dolphinfish (mahi-mahi or dorado) and in tuna purse seine fisheries, especially in sets made around floating objects, which act as a focal point for a great deal of other marine life besides tuna. In 2003, the South Atlantic Fishery Management Council issued a Dolphin Wahoo Fishery Management Plan for the Atlantic. However, the species as a whole is not considered overfished. In most parts of its range, the wahoo is a highly prized sport fishing catch. It reaches a good size, is often available not too far from land, and is a very good fighter on light to medium tackle. It is known in sports fishing circles for the speed and strength of its first run. The aggressive habits and razor-sharp teeth of the wahoo can be of considerable annoyance when targeting larger gamefish, however, such as tuna or marlin. ^ a b Froese, Rainer and Pauly, Daniel, eds. (2018). "Acanthocybium solandri" in FishBase. February 2018 version. ^ Robson Green (23 May 2013). Extreme Fishing. Simon and Schuster. pp. 115–. ISBN 978-1-4711-2750-2. ^ Sloan, Robert (September 21, 2007). "Live-Line A 'Hoo". Saltwater Sportsman. Bonnier. Retrieved January 4, 2019. ^ a b c Mike Lane. Angler's Guide to Fishes of the Gulf of Mexico. Pelican Publishing. pp. 361–. ISBN 978-1-4556-0032-8. ^ a b "Wahoo Fast Facts". Florida Fish and Wildlife Conservation Commission. Retrieved June 15, 2012. ^ a b Wendy Sweetser (2009). The Connoisseur's Guide to Fish & Seafood. Sterling Publishing Company, Inc. pp. 94–. ISBN 978-1-4027-7051-7. ^ Lenny Rudow (23 April 2012). Rudow's Guide to Fishing the Mid Atlantic. Geared Up Publications. pp. 192–. ISBN 978-0-9787278-0-2. ^ Williams Jr., William H.; Bunkley-Williams, Lucy (1996). "Parasites of Offshore Big Game Fishes of Puerto Rico and the Western Atlantic" (PDF). University of Puerto Rico at Mayagüez. Retrieved June 15, 2012. ^ a b "Dolphin/Wahoo". South Atlantic Fishery Management Council. Retrieved June 15, 2012. ^ "Fishery Management Plan for the Dolphin and Wahoo Fishery of the Atlantic" (PDF). South Atlantic Fishery Management Council. January 2003. Retrieved June 15, 2012. 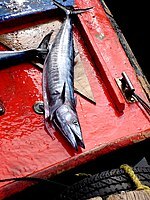 Atlantic wahoo NOAA FishWatch. Retrieved 13 November 2012. Zischke, Mitchell T.; Griffiths, Shane P.; Tibbetts, Ian R. (22 May 2013). "Rapid growth of wahoo (Acanthocybium solandri) in the Coral Sea, based on length-at-age estimates using annual and daily increments on sagittal otoliths". ICES Journal of Marine Science. 20 (6): 1128–1139. doi:10.1093/icesjms/fst039. Zischke, Mitchell T.; Farley, Jessica H.; Griffiths, Shane P.; Tibbetts, Ian R. (December 2013). "Reproductive biology of wahoo, Acanthocybium solandri, off eastern Australia". Reviews in Fish Biology and Fisheries. 23 (4): 491–506. doi:10.1007/s11160-013-9304-z.